Forest Hill residents Shirley Howard and Ruth Antoniades are pictured here wearing fascinators while watching the May 19 wedding of Prince Harry and Meghan Markle. Royal fever was in full swing at Forest Hill during the two weeks leading up to the wedding of Prince Harry and Meghan Markle on May 19, and the Kanata, Ont. long-term care home hosted a wide variety of activities aimed at celebrating the couple’s big day. While the Forest Hill team planned to do something for the residents to help them celebrate the royal wedding, it was life enrichment aide Joanne Vachon who proposed staff members create two weeks of programming leading up to the wedding. Activities included a YouTube presentation on Buckingham Palace, another presentation on the crown jewels, royal trivia and discussions about royal scandals. Residents were even treated to a mock wedding shower where games were played and food was served. One program was also centred on wedding dresses, and staff members and family members brought in the outfits they wore to their weddings. The program was successful at helping residents reminisce about their own weddings, and a lot of questions were asked, says life enrichment co-ordinator Craig Forrest. “We had dresses that were 70 years old, and some of them were fairly recent,” he tells The OMNIway. Of course, no royal wedding would be complete without fascinators for the ladies. 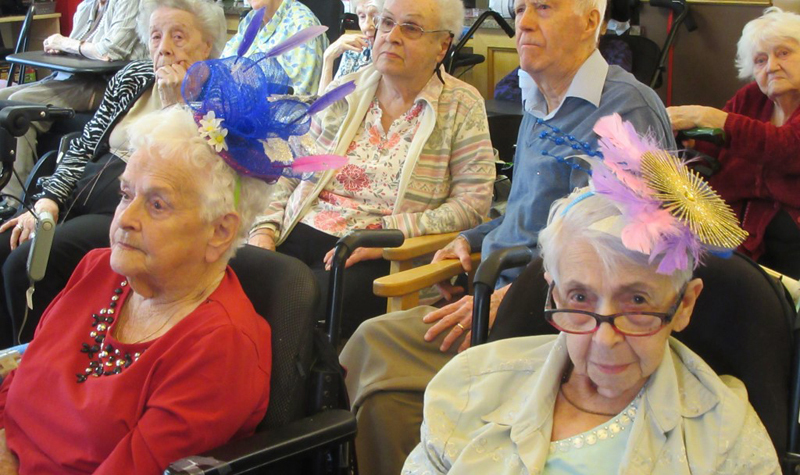 Prior to the wedding, the life enrichment department hosted a two-day crafts program where the ladies made fascinators to wear when they watched Harry and Meghan take their vows on TV. “Overall, it was a fun couple of weeks, and the residents really enjoyed it,” Craig says.